Group A streptococci (GAS) can cause various diseases, including strep throat, skin and soft-tissue infections (eg, pyoderma, erysipelas, cellulitis, necrotizing fasciitis, myositis, osteomyelitis, pneumonia, abscess), severe systemic disease, and long-term nonsuppurative complications (eg, rheumatic fever, acute glomerulonephritis). Streptococcal pharyngitis is strongly suggested by the presence of fever; tonsillar exudate; tender, enlarged, anterior cervical lymph nodes; and absence of cough (Centor criteria). Strep throat has an incubation period of 2-4 days and is characterized by sudden onset of sore throat, cervical lymphadenopathy, malaise, fever, and headache. Younger patients may also develop nausea, vomiting, and abdominal pain. Acute sinusitis manifests as persistent coryza, postnasal drip, headache, and fever. The most important historic information to obtain in the evaluation of a sore throat is whether other symptoms of upper respiratory tract infection are present or not. Children with streptococcal pharyngitis do not have cough, rhinorrhea, or symptoms of viral upper respiratory tract infection. Indeed, the diagnosis of streptococcal pharyngitis can effectively be ruled out on the basis of the clinical findings of marked coryza, hoarseness, cough, or conjunctivitis. However, although these are important exclusionary criteria, the pediatrician must be aware that signs and symptoms of streptococcal pharyngitis may otherwise be nonspecific and that they vary widely depending on patient age, severity of the infection, and timing of the illness. Relatively few localizing or constitutional symptoms may be present, such that the illness may be unrecognized (subclinical infection). Young infants do not present with classic pharyngitis. Streptococcal upper respiratory tract infections in infants and toddlers instead may be characterized by low-grade fever, anorexia, and a thick, purulent nasal discharge (so-called streptococcosis). Conversely, some patients may be toxic, with high fever, malaise, headache, and severe pain upon swallowing. Streptococcal toxic shock can be associated with pharyngitis; however, this is rare. Vomiting and abdominal pain may be prominent early symptoms simulating gastroenteritis or even acute appendicitis. Hence, streptococcal pharyngitis should be considered in a child with acute onset of abdominal pain. Because streptococcal pharyngitis is chiefly a disease of winter and spring and primarily affects children older than 3 years, fewer throat cultures should be completed in the summer and in children younger than 3 years. 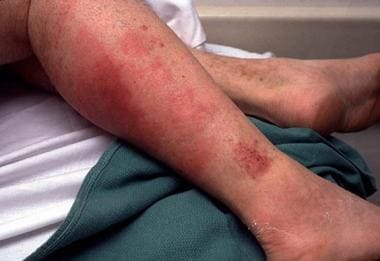 Scarlet fever results from pyrogenic exotoxin released by GAS and is characterized by a scarlatiniform rash that blanches with pressure. The rash usually appears on the second day of illness and fades within a week, followed by extensive desquamation that lasts for several weeks. A history of recent exposure to another individual (eg, classroom or household contact) with streptococcal infection is a helpful clue. Isolation of S pyogenes from the pharynx confirms the diagnosis in uncertain cases, and serologic evidence of recent GAS infection may be present (ASO or anti-deoxyribonuclease B [anti-DNase B] antibody response). Perianal cellulitis and vaginitis should be considered in children who report perineal discomfort or vaginal discharge. This form of streptococcal infection is usually painless, and the patient is usually afebrile. Streptococcal impetigo usually has the highest prevalence in young children (aged 2-5y). Infection spreads readily to other individuals from the skin lesions, and multiple occurrences within families are common. 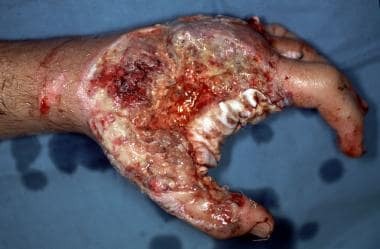 Necrotizing fasciitis caused by S pyogenes (so-called streptococcal gangrene) is an acute, rapidly progressive, severe, deep-seated infection of the subcutaneous tissue that is associated with extensive destruction of superficial and deep fascia. It may arise following minor trauma or from hematogenous spread of GAS from the throat to a site of blunt trauma or muscle strain. Although any part of the body may be affected, streptococcal fasciitis usually begins on an extremity. Unexplained and rapidly progressing pain may be the first indication of necrotizing fasciitis. Pain may be disproportional to the physical findings; indeed, exquisite pain occurs at the affected site, so a finding of severe, excruciating pain that seems inconsistent with the observed clinical findings should strongly suggest the possibility of this diagnosis. 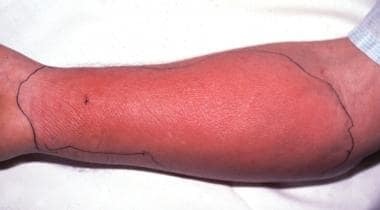 Erythema may be diffused or localized or may be absent. Fever, malaise, myalgias, diarrhea, and anorexia may also be present. Hypotension may develop initially or over time. Surgical exploration is critical for establishing the diagnosis and directing management. A major risk factor for the development of streptococcal necrotizing fasciitis is a history of recent varicella-zoster virus (VZV) infection. The risk of varicella-associated necrotizing fasciitis should decrease with the implementation of routine childhood immunization against VZV. The risk factors for GAS bacteremia vary with age. Among children younger than 2 years, risk factors include burns, varicella virus infection, malignant neoplasm, and immunosuppression. Among individuals aged 40-60 years, the risk factors for GAS bacteremia include burns, cuts, surgical incisions, childbirth, IV drug abuse, and nonpenetrating trauma. Predisposing factors for GAS bacteremia in elderly people include diabetes mellitus, peripheral vascular disease, malignancy, and corticosteroid use. GAS bacteremia usually results from invasive GAS infection. TSS is characterized by early onset of shock and multiorgan failure. Blood cultures results are positive in approximately 60% of STSS cases. These patients usually develop renal failure, acute respiratory distress syndrome, hepatic dysfunction, hematologic abnormalities, confusion, skin lesions, and diffuse capillary leak syndrome. The presence of 2 major manifestations or of 1 major and 2 minor manifestations, supported by evidence of a preceding GAS infection by positive throat swab or culture results or by high serum ASO titers, strongly suggests ARF. Following the initial pharyngitis, a latent period of 2-3 weeks occurs before the first signs or symptoms of ARF appear. Rheumatic heart disease is a sequela of ARF that manifests as valvular heart disease 10-20 years after the causative episode of ARF. This manifestation occurs rapidly within days after streptococcal pharyngitis and is characterized by acute renal failure with hematuria and nephrotic-range proteinuria. Physical findings of pharyngitis include erythema, edema, and swelling of the pharynx. The tonsils are enlarged, and a grayish white exudate may be present. Submandibular and periauricular lymph nodes are usually enlarged and tender to palpation. Scarlet fever, characterized by diffuse erythematous eruption, fever, sore throat, and a bright red tongue, can accompany pharyngitis in patients who have had prior exposure to the organism. The rash of scarlet fever requires the presence of pyrogenic exotoxin and delayed type skin reactivity to streptococcal toxins. Upon physical examination, children with classic group A streptococcal pharyngitis are more likely to demonstrate tonsillopharyngeal erythema, a red edematous uvula, palatal petechiae, and tender anterior cervical adenopathy than are children with pharyngitis arising from other etiologies. Typically, tonsils are enlarged and erythematous, with patchy exudate on the surface, although the presence of exudate is not pathognomonic for streptococcal pharyngitis and may be observed in the context of other bacterial and viral etiologies of pharyngitis, particularly Epstein-Barr virus. Patients with pharyngitis may also develop chills and fever. A study from the University of Pittsburgh School of Medicine established a patient-reported outcome measure (Strep-PRO) for assessing symptoms of group A Streptococcus pharyngitis from the child's point of view. Preliminary data suggest that the scale effectively measures pain and overall functional status and support the use of Strep-PRO as a measure of outcome in future clinical trials. Patients usually do not have systemic symptoms. Streptococcal impetigo begins with the appearance of a small papule that evolves into a vesicle surrounded by erythema. The vesicle turns into a pustule and then breaks down over 4-6 days to form a thick, confluent, honey-colored crust. The characteristics of streptococcal impetigo lesions thus contrast with the classic bullous appearance of lesions that arise from impetigo due to phage group II Staphylococcus aureus. However, evidence now indicates that many cases of nonbullous impetigo are, in fact, mixed infections containing both S aureus and S pyogenes. Therefore, conclusions about etiology based on the clinical appearance of impetigo should be drawn with caution. Lesions are most commonly encountered on the face and extremities. If untreated, streptococcal impetigo is a mild, but chronic, illness, often spreading to other parts of the body. Regional lymphadenitis is common. The M types that give rise to streptococcal tonsillitis (ie, types 1, 3, 5, 6, 12, 18, 19, 24) are rarely found in streptococcal impetigo. One of the streptococcal pyoderma-associated strains, the M49 strain, is very strongly associated with PSGN. Deeper soft-tissue infections may occur following colonization of the skin with S pyogenes. A deeply ulcerated form of streptococcal impetigo, ecthyma, may complicate streptococcal impetigo. Ecthyma tends to be a more deep-seated and chronic form of streptococcal impetigo and is encountered mainly in the tropics. 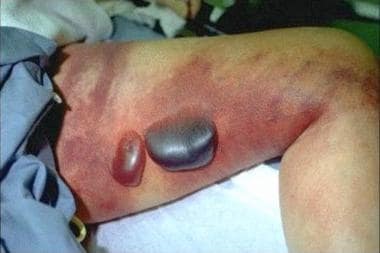 Streptococcal cellulitis is an acute, rapidly spreading infection of the skin and subcutaneous tissue that can follow the occurrence of burns, wounds, surgical incisions, varicella infection, or mild trauma. Pain, tenderness, swelling and erythema, and systemic toxicity are common, and patients may have associated bacteremia. Careful serial examination is crucial because cellulitis may progress to necrotizing fasciitis. (See the image below). Today, erysipelas is a relatively rare acute streptococcal infection involving the deeper layers of the skin and the underlying connective tissue. Skin over the affected area tends to be swollen, red, and exquisitely tender, unlike in streptococcal impetigo, which is usually painless. Superficial blebs may be present. The most characteristic finding in erysipelas, the sharply defined and slightly elevated border, helps to differentiate this entity from cellulitis, which has an indistinct border. At times, reddish streaks of lymphangeitis may project out from the margins of the lesion. Systemic toxicity is common. For both erysipelas and cellulitis, cultures obtained by leading edge needle aspirate of the inflamed area are warranted. In patients with pneumonia, crackles may be found on physical examination. In patients with empyema or pleural effusion, decreased breath sounds and dullness on percussion are observed. Necrotizing fasciitis is an extensive and rapidly spreading infection of the subcutaneous tissue and fascia that is accompanied by necrosis and gangrene of the skin and underlying structures. Differentiation between streptococcal cellulitis and necrotizing fasciitis can be difficult, and careful serial physical examination is crucial. Scarlet fever rash usually appears within 24-48 hours after onset of symptoms, although it may appear with the first signs of illness. It is often initially noticed on the neck and upper chest as a diffuse, finely papular, erythematous eruption producing a bright red discoloration of the skin that blanches on pressure. The texture is that of fine sandpaper. The flexor skin creases, particularly in the antecubital fossae, may be unusually prominent (ie, Pastia lines). The area around the mouth is pale, creating the appearance of circumoral pallor. In severe cases, small vesicular lesions (ie, miliary sudamina) may appear on the abdomen, hands, and feet. Toward the end of the first week of illness, the rash begins to fade and is followed by a desquamation over the trunk, which progresses to the hands and feet. Typical scarlet fever is not generally difficult to diagnose, but it may be confused with roseola, Kawasaki syndrome, drug eruptions, and toxigenic S aureus infections. In a patient with acute glomerulonephritis, even in the absence of bacteriologic confirmation of S pyogenes, the presence of skin lesions compatible with streptococcal impetigo is highly suggestive of PSGN. Signs of sepsis (eg, fever, tachycardia, tachypnea, hypotension) may be present in invasive infections.